AngryJellyfish – The blogger who runs my favorite weekly review blog. Few can sustain watching so many anime for so long! Goodbyenavi – She’s often very busy these days, but she’s the first person to ever comment on my blog and still finds time to chime in now and then. Celeste Angelus – One blogger whom I feel very similar to. I always enjoy reading his articles on philosophy and theology. 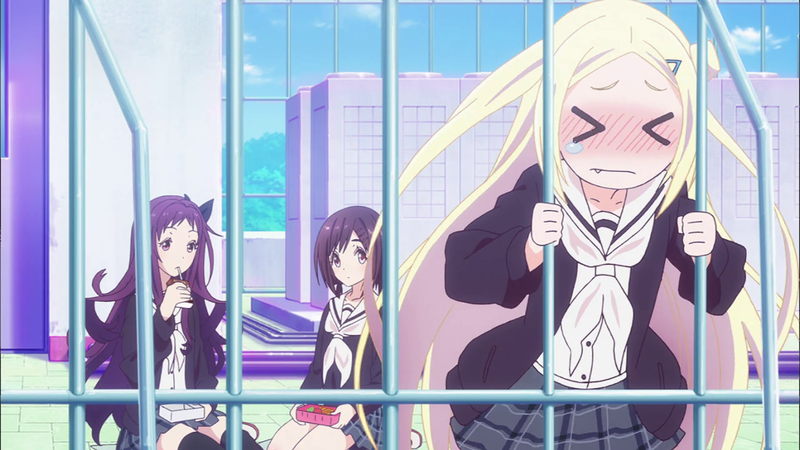 Cytrus – Ever since writing an article which took a dim view of Buddhism, we’ve had very interesting discussions on a variety of topics, the last of these concerning just what falls under the Yuri genre. David A – My most frequent commentator. He doesn’t have a blog yet, but I’m sure that it would be very intriguing. Feidor S. LaView – I should have mentioned this loyal reader ere now. He’s writing a fascinating dark fantasy novel which displays a very literate mind conversant with Classical mythology. You simply need to start reading Seagrave’s Journey. Foxfier – A somewhat frequent commentator on my blog with very eclectic interests. 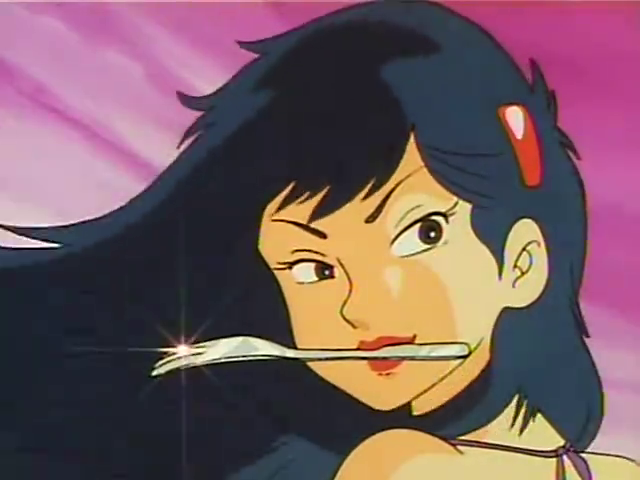 Genkinahito – Has some of the best commentary on anime and Japanese films on the internet. Luminas – A very deep commentator, always interesting. MIB – A blogger with a wide-ranging interest in foreign and classic movies and anime. I especially owe him thanks for always listing me among his list of twitter links which ought to be followed. M. Joelle – A very loyal commentator. Her articles on philosophy and creative writing are well worth reading. Nami – Her long-winded comments are perhaps some of the most interesting things you can find on my site. 🙂 Be sure to visit her blog, which covers K-dramas, religion, anime, and many other things. Suburban Banshee – A true medievalist and lover of the Catholic Church. The Overlord Bear – Perhaps the most understanding and candid of my commentators. Be sure to check out his blog! TWWK – Last but not least. He runs a fantastic Christian aniblog with a large staff. My articles would not reach so many people without his help. Honorable mentions and gratitude go to Jubilare, Josh W, Japesland, and all my other dear readers. Let’s get on to some facts about me. Since these facts are supposed to be things my readers may not know, I have declined from repeating any information which may be found in the following articles: A Medieval Interrogation, Nominated for Leibster Award, Leibster Award Again!, and ABC Awards Nomination. Yes, I am rather fond of the awards this site has been nominated for, and those articles make for interesting reading–especially the ABC Award one, where I struggled greatly to find new information for my readers. St. Anthony of Egypt is my favorite Desert Father and his icon hangs above my left shoulder along with St. Michael’s when I type these posts. 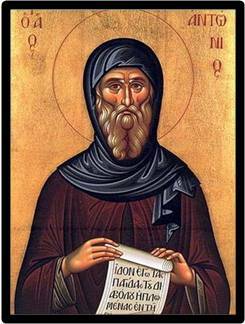 St. Anthony, according to the information we have, lived to be 105 years old! Smoked beer is better than I thought it would be. I recently tried De Dues Tocatta, a Spanish beer, (also my first Spanish beer. I did not know that that country produced any!) and found it quite good. The smokiness reminded me of an Islay Scotch Whisky. Greek fisherman hats are cool. I now have two in my possession. Both are navy blue, but the woolen one is more suitable for the winter, while the cotton one is best for now. Noodler’s is my favorite brand of bottled ink. Not too pricey, and each bottle comes with a full three ounces of ink (with a few exceptions)–more than most companies are willing to put in each bottle! When I was very young, I used to be enthusiastic about card games and learned dozens of games which hardly anyone plays. But, I could not find anyone to play cards with except my grandfather, who was more interested in rummy, poker, and certain Croatian card games (Trešeta in particular). Well, there you have it, my dear readers. I hope that you enjoyed this article, and thank you again for reading and your comments! 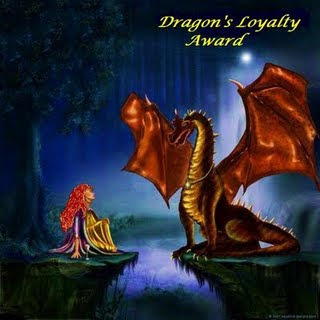 This entry was posted in Blog Business and tagged award, blogger, commentators, dear readers, followers, Fun Facts, Josh W, Loyalty Award, Loyalty of a Dragon Award. Congratulations and thank you so much for the mention! I love your blog – a well deserved award!. I’m so happy to see you posting more frequently, and I’m also very interested in knowing more about Greek fisherman hats. I’d love to see a picture, or hear a more detailed description! Thank you! You run an excellent blog yourself. Perhaps, I’ll write a post on the Greek fisherman hat in future. 🙂 Otherwise, you can find pictures of some nice ones at the Village Hat Shop: http://www.villagehatshop.com/category/78/1/greek-fisherman-caps.html. Greek fisherman hats are cool. I always welcome your opinion on anime which differs from others, because of the unique perspective from which you approach it. I may not fully understand all of your blog posts but it is clear you have put a lot of thought into them so kudos for your devotion to your craft. Thank you! 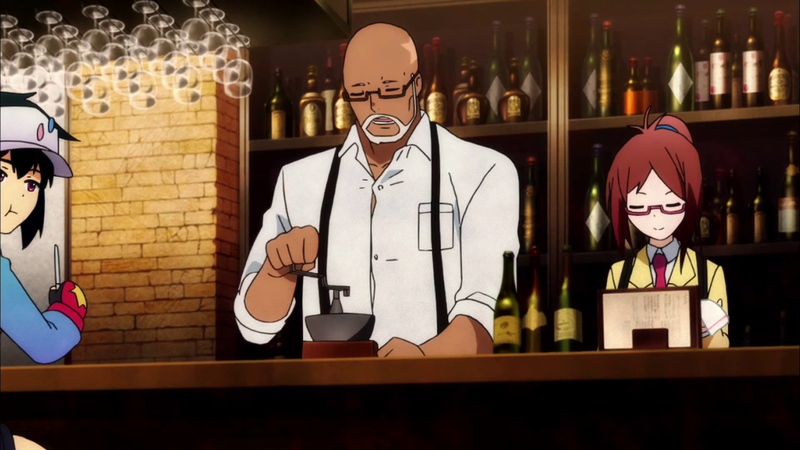 I should write my mid-season review pretty soon, which includes Re-kan, Seraph of the End, Arslan Senki, Knights of Sidonia, Danna ga Wakaranai, and Gunslinger Stratos. Actually, with some of my older posts, I myself sometimes need to struggle to remember what I was writing about. 🙂 But, I do like picking apart some of the more obscure threads I see in anime. Congrats on the award, mate! You’re one of the best bloggers out there, and getting recognition for it is awesome. Thanks! And your blog, with the way it covers old films and aspects of Buddhism and Japanese culture in anime, is also great fun to read. Thank you so much, and congratulations on your well deserved award! I always enjoy reading your opinions and reflections, and discovering new and interesting things here. As stated above, I also consider you to be one of the best bloggers around. Thank you! I shall see very soon whether the final judge decides my novel merits above the other five who made the final cut. I’ll third the good luck on your book! Congratulations and thank you! I didn’t know I was the first. I just found your blog to be well-done and thought provoking. I’m working on being more active, got a post in draft now! Keep up the good work! Fables, by the way, is such an interesting looking series – I’ve long wanted to start reading some of the comics, but along with so many other interests, that one’s been placed aside in a “one day” pile. I know what you mean. I only read it because a friend of mind has become a fan of American comics and greatly encouraged me to do so. The series is quite good, even if rather bloody at times. That the Big Bad Wolf is the hero of the story and a real patriot amuses me to no end. Thanks for the award! I will pass it on. Btw, there is ABSOLUTELY NO reason you shouldn’t self-publish your novel, if you don’t win the contest. If even a slacker like myself can manage to put out Kindle and print versions of non-fiction books with horrendous footnotes, you can put out a novel! And self-publicize it, too! 1. You network a lot. 2. I can point you to how to do the Kindle stuff. 3. Createspace and similar print outlets are also not that difficult. I haven’t done iTunes, GooglePlay books, or so on, but they are apparently doable, too. If you want to give me the links for how to publish Kindle and Createspace, I’d be very grateful. Thanks! Thank you for following my blog so avidly! Why, thank you! I gratefully accept.